Note: about 7zSD.sfx and app.tag: you can also use the 7zSD.sfx from the 7-zip website, but it will give you a different setup-icon in the end. 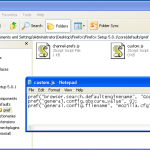 To create the app.tag-file, save the code in an ASCII-file (notepad) and save as app.tag (example). Default settings can be changed by an end-user. In this example we will use Google as default search engine, but an end-user could prefer Bing and using this method will give them the possibility to customize this. The end-user preferences will be stored in his own profile and the change will be limited to that profile. Warning: Not all options work so be sure to test them out! Navigate to core\defaults\pref\ and open/create custom.js with a text-editor (fig03.png). 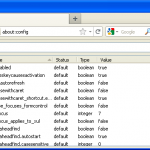 To find the default keys and values, open firefox and enter about:config in the address bar (fig04.png). Locked preferences are the same as default settings, with the exception that user can’t change the setting. Locked preferences are grayed out in the options menu our shown italic in about:config(fig05.png). In our example we will prevent client updates (and corresponding messages), because users don’t have the necessary right to do an update. But we will allow them to update there add-ons (or extensions) because updated add-ons are stored inside there profile. 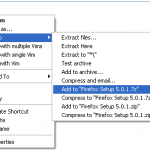 Firefox will also check once a week for an add-on update instead of the default one day. 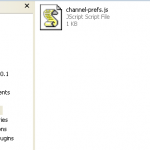 First navigate to core\defaults\pref\ folder and create/modify the text file custom.js (fig06.png). 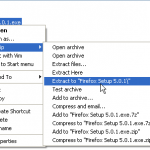 Next, navigate to core\ and create or modify the text file: mozilla.cfg (fig07.png). The interval is 604800000 milliseconds, which is 7 days or once a week. Changing the default homepage is maybe the most common thing for a enterprise setup. 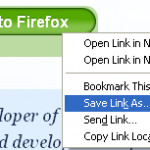 But since version 4 from Firefox, changing this setting is harder than you would expect from an “open” browser. 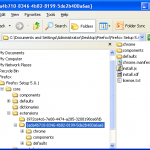 In the core-folder you find the file omni.jar. Unlike standard jar-files, which are zip-files, this is an optimized version using a python script. The big disadvantage is that 7-zip is unable to open the file because it handles compressed files really strict. Lucky for us, the extractor build into windows is less strict. 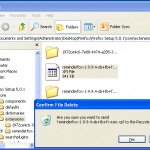 Rename the file omni.jar to omni.zip (fig09.png) and right click on the file > Extract All… (fig10.png, fig11.png). Go to the folder where you extracted the files (normally \core\omni) and navigate to chrome\en-US\locale\branding (fig12.png) . 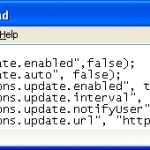 Open the file browserconfig.properties with a text-editor and change the setting browser.startup.homepage (fig13.png). Notice the little square in fig13.png? That’s just a line break under *nix, you can just remove it. Go to the omni-folder and compress all the files and folders to omni.zip. 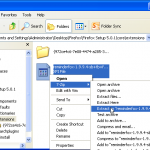 You can use 7-zip if you like, because this time we aren’t going to use an optimized version. 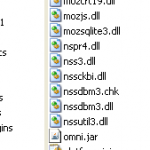 (fig14.png) Rename the file to omni.jar. Than move this file to the core-folder (fig15.png). It’s best to do a little clean-up and remove omni.zip and the folder omni. Extensions or Add-ons can be found on https://addons.mozilla.org, in this guide we will use ReminderFox by Tom Mutdosch and Daniel Lee. You can find it here. 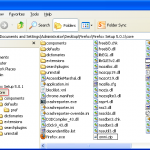 Download the add-ons (use save as…) (fig16.png) and extract the .xpi file with 7-zip to an empty folder inside core\extensions (fig17.png, fig18.png). 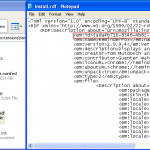 In the folder where you extracted the add-on, you will find the file install.rdf. This is an XML-file and you just need to open it with a text-editor. Inside the xml element <rdf:description> you find the xml element <em:id> (fig19.png). Rename the folder of the add-on to the value of <em:id> (fig20.png). Little note: In the future you won’t need to extract the .xpi file and you just need to place them inside core\extensions. It’s on the roadmap of the Mozilla team. The next and final step is optional, you can go to the extraction folder of the setup file an just run setup.exe (fig21.png). 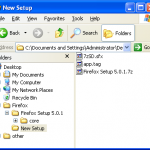 It depends on the way you deploy the installation, but in most cases you are better off with one compact setup file. 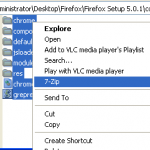 copy /b 7zSD.sfx+app.tag+"Firefox Setup 5.0.1.7z" "Customized Firefox Setup 5.0.1.exe"
Note: You need to change Firefox Setup 5.0.1.7z to the name you have used to create the 7-zip container. 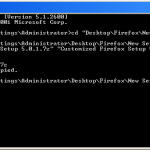 And that’s it, Customized Firefox Setup 5.0.1.exe is now you customized Firefox installation file. I hope you find this guide useful to create a customized setup for you enterprise environment. If you have any comments or remarks, feel free to do so. The same way for spelling error’s, English isn’t my native language, so please if you find one (and I’m sure you do), let me know. 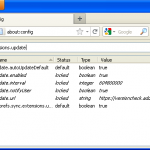 force the bookmark toolbar to show in the default install?